Are you ready to invest in your first portable police scanner? Whether this is your first scanner ever or you already have a home-based scanner and now want a portable unit, today's market is rather confusing. It's often tempting to look only at the most affordable scanners, but it's to your advantage to become familiar with the features offered on scanners in all price ranges. That can take time, so we created this guide to deliver trustworthy information fast. Keep reading to learn how to select the best portable scanner for your needs. 3.1 How Many Channels Do You Need? Learning about portable police scanners in general is important, but how do you isolate the best scanners from those less likely to fit your needs? Reading our portable police scanner reviews is the fast and easy way to compare some of the best scanners out there today. The Uniden BCD325P2 is a very good portable police scanner if you can afford to invest more than $300. It's equipped with infrared technology and uses a trunking system to group similar frequencies, giving you more power and greater reach into the world around you. You can scan more than 20,000 channels, which enables you to follow local events, catch your sports broadcasts and track the weather in addition to monitoring your local police and fire station activity. The Uniden BCD325P2 is also equipped with location-based scanning, which allows you to quickly tune into your local channels. This is a compact scanner that many users find convenient when traveling in a car or walking around the neighborhood. While you can expect to spend some time programming the scanner when it first arrives at your home, it is one of the most powerful portable scanners available today once it is fully set up. While we consider the Whistler WS1010 one of the best portable police scanners available today, we admit that its sensitivity isn't as consistent as some other scanners. For this reason, it may not fit your needs if you often find yourself in remote areas where weak signals are the rule rather than the exception. What the Whistler WS1010 does offer is an affordable price tag and a compact size that makes it easy to carry. It weighs less than eight ounces, so it's a great pick if you may take it with you while traveling. What really attracts us to this Whistler scanner is the advanced features that aren't always found on scanners within this low price range. For instance, you can lockout channels that you don't want to hear, delay scanning for easier monitoring or specify one channel to recheck for activity at regular intervals. You also have 10 blocks for storing your favorite channels. This will allow you to store all of your preferred frequencies and go back to them by pushing just one button. Are you concerned about the complicated process of programming your new portable scanner? The Uniden BCD436HP makes that process simple by allowing you to plug in your zip code for fast programming. This allows you to use the scanner right out of the box. 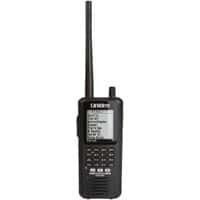 We also appreciate that the Uniden BCD436HP radio scanner offers location-based scanning. This is a feature that allows you to quickly pick up active channels in your current location, so you won't spend a lot of time searching for new frequencies if you use your scanner while traveling. What happens if you find a channel that you don't want to listen to? You can use the avoid feature to ignore it. What about channels you love? Add them to your favorites list, and you can tune into them at any time by hitting one button. This isn't the cheapest portable police scanner, but it is one of the best in terms of features and quality. Fully charged batteries can last up to eight hours. While reading police scanner reviews is important to making an informed buying decision, keep in mind that the best portable police scanner for you is likely different from the best scanner for someone else. Spend a few minutes thinking about what you want to accomplish with your scanner. Do you just want to pick up frequencies used by your local police and fire department? Or would you like to pick up frequencies broadcasting further from your home? Your answer to these questions will determine the reach of your ideal scanner, which will impact how much you're likely to spend on the top portable police scanner for your personal needs. You can pay less than $100 for a quality scanner that covers your local town, but you will need more power and reach to extend your range. 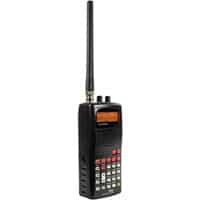 One feature that you will see when shopping for a portable police scanner is the number of channels that you can program into the radio. This ranges from about a dozen channels to more than 1,000 channels. Not everyone needs to store thousands of channels, but it's still wise to invest in a scanner that programs more channels than you may think that you need. This ensures that your scanner will grow with you if your interests expand over time, eliminating the need to buy a better scanner in a year or two. Sensitivity – This term refers to the scanner's ability to pick up and magnify weak signals. If you live in a small town or will take your portable scanner to remote areas, you will need a scanner with excellent sensitivity. This may not seem as important if you use your scanner primarily in larger cities with many strong signals. In that case, selectivity is more important because you will need to ignore some frequencies to pick up the ones that you really want to hear clearly. 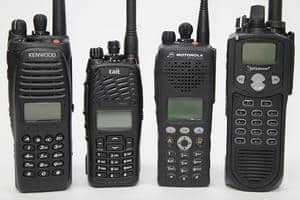 Narrowband – Picking up narrowband FM channels allows you to listen to government, television and other specialized transmissions. Trunking – These scanners connect similar frequencies into groups, which are sometimes referred to as blocks. The trunks are rotated rather than requiring you to search out individual frequencies. Priority Channels – The scanner will continuously go back to one specific channel to check for activity at scheduled intervals. Squelch – You set a specific signal strength, and the scanner automatically silences itself until a signal of that strength is detected. There are many other features that you'll see when shopping for the best portable police scanner. We introduced you to many of them in our police scanner reviews. If you have the money to invest or you can catch it on sale, our top pick is the Uniden BCD325P2 portable scanner. It's lightweight and conveniently sized for travel, and it has the power and advanced features that you need to get the most out of your scanning experience. If you're budget prevents you from investing in the Uniden scanner or you don't need all of those advanced features, then we recommend the Whistler WS1010. This is the best portable police scanner for anyone trying to balance quality with price. We've create a buyer's guide that will tell you everything you need to know to buy the best police scanner.